Powers/Abilities/Functions: A Mandroid is a heavily armored personal combat suit. Musculature enhancements: Amplifies wearer's strength about 20 times. Limits: DC electric motors allow for severe overloading with a theoretical limit of 500% for .01 seconds. Primary: Thermoelectric radioisotope electric generator, 50,000 watts. Secondary: 15,000 watt exotic, high density battery. Type: Body motion following sensors. Sub-systems: Verbal instructions, limited commands. Range: High altitude to deep water: 70,000 feet above to 800 feet below. Air supply duration: 1,2 hours. Pressure: Normal atmosphere (14.7 psi) provided internally over a wide external range. Type: full spectrum chemical, biological, nuclear environment. Range: 2 months of filtered external air. Exposure: Suit can tolerate short periods of high radiations by stepping up magnetic beam generator's activity. Type: Locomotor (walking) capacity through muscle amplification. Maximum speed: 45 mph for 14 minutes. Limits: repelling field dis not affect masses greater than 50 lbs. Limits: not effective in smoke, fog, clouds, etc. Description: also installed in the arms, operates off magnetic force. Major: Electro-magnetic repelled field generator. Description: Backside located generators enabling protective force field against metallic object. Description: High voltage electrical dischargers. Communication systems: Numerous secure audio and visual channels available to user, with an average range of 30 miles (in combinations with communications relay satellite; worldwide). External sources may take over programming in event of wearer failure. Computer: On board housekeeping routines, which supervises all suit systems. Verbal recognition system with self-motivation programming that allows the suit to function autonomously under some battle conditions and in the vent of the user impairment. Secondary layer: Mixture of foamed steel alloy with internal reinforcing filaments to improve resistance to flexing. Tertiary layer: Mechanical support and suit environment control. Final layer: anti-chafing material against body. Armor articulation motivation: High efficiency electric motors. Major: Neuro-Stunner (1), more refined version of the Stun Cannon. Description: hand-mounted projector, inflicts no real damage other than stunning..
Limits: tractor beam can effect 950 lbs. mass. Major: Electro-gravity tractor/repelled field generator. Description: hip-pod located generators enabling protective force field or tractor beam. Sensors: Infravision for 175 feet, Radar/Sonar, all senses of wearer receive remarkable protection. Height (overall): 97" - 15"
Musculature enhancements: Amplifies wearer's strength about 100 times. Air supply duration: 6 hours. Description: gun adapted to right hand, stored in internal compartment. Communication systems: Numerous secure audio and visual channels available to user, with an average range of 30 miles (in combinations with communications relay satellite; worldwide). Computer: On board housekeeping routines, which supervises all suit systems. Verbal recognition system. Major: high penetration bullets gun-machine. Description: arm-mounted firemouths with loader in the left part of the back. Type: Flight capacity through back jet thrusters (2). Description: left four-fingers hand laser projector. Description: right hand-mounted multi-purpose projector enabling protective force field or tractor beam. Communication systems: Numerous secure audio and visual channels available to user. Sensors: Infravision, Radar/Sonar, all senses of wearer receive remarkable protection. Weigth: more than 2000 lbs. Surface/Primary Layer: Unrevealed. Its resistance was far weaker than the previous models. Musculature enhancements: Amplifies wearer's strength to Peak Human Level. Description: Vibrations absorbing liquid, located in the shell around the operator. Communication systems: Mostly unrevealed. Numerous secure audio and visual channels available to user. Range: High altitude to 100 feet underground at least. Type: Flight capacity through underfeet repulsors. Description: right hand-mounted gun with ammunition container on the back. Description: shoulder located light emitters. Communication systems: Numerous secure audio and visual channels available to user (in combinations with communications relay satellite; worldwide). External sources may take over programming in event of wearer failure. Surface/Primary Layer: Titanium coating. It can withstand high-impact shells, high heat, and radiation levels. Air supply duration: 24 hours. Type: Flight through rocket boosters. Major: Ice and Heat Blasters (2). Description: disappearing from radar ability. Range: 6 minutes at a time before reappearing on radar. Communication systems, Computer, Sensors: Unrevealed. Musculature enhancements: Amplifies wearer's strength. Sub-systems: buttons on the collar, associated to a limited set of functions. The armor could be contained in a collar, and could expand to cover the whole body with streaks of adamantium. Type: Electric strains, nano-bodies intruders. Exposure: Suit can insulate wearer from external intrusions of nanite size. It tolerates short periods of abnormal temperature and electric voltage. Description: Energy aura producing invisibilty to human eye and to many electromagnetic frequencies. Range: Objects at body contact not so larger than human body size. Description: Programmable buttons enabling to fully control other Mandroid armors of the same type, to entrap or help other subjects. Communication systems: Unrevealed, possibly non-existent. Computer: On board housekeeping routines, which supervises all suit systems. History: (CaptainAmerica I#351 (fb) - BTS) - The SHIELD performed severals experiments with different versions of exo-skeletons and suits of armors before producing the first model of Mandroid. The experimental versions were called proto-mandroids. Some of them had even no attack capabilities. When the final model of Mandroid was approved, the prototypes no more useful were stored in the SHIELD headquarters arsenal, in midtown Manhattan. (Avengers I#94/Marvels#4) - The first, real, Mandroid armor was designed and engineered by the Stark Industries for the U.S. Government to be primariry employeed as protection against opponents with super-human powers. The armors were given to the SHIELD, but the first, real, time that the suits were used they were sent from the Commission of the Extra-terrestrial Activities to capture the Avengers, when the heroes were involved in the Kree-Skrull intergalactic War. The armors were set-up to contrast the powers of the Avengers, sure of their power, three Mandroids attacked the Avengers. (Avengers I#95) - For a while, the Mandroids caused some problems to Giant-Man, Captain America and the Vision, but Iron Man, who knew the armors' weaknesses, succeeded in deactivating them without harming the pilots inside. While the Avengers splitted their ranks, other agents activated the manual Masers and took control of the armors, although the pilots were still knock-out. They attacked Thor, Iron Man and the Vision, but were eventually deactivated. (Uncanny X-Men I#118) - Moses Magnum had some units of Mandroids built and improved, after having acquired the plans and projects of the armors. For his plan to blackmail Japan, he sent the Mandroids to kidnap or kill the Japanese Government's representants, whose meeting was at Shiro Yashida's house. But the Mandroids, unespectedly, found also the X-Men. Not prepared to fight the mutants, the mercenaries were defeated. One of them was torn in slices by Wolverine's claws, another armor crumbled in pieces under a combination of Cyclops' optical rays/Banshee's sonic scream. The third, even resisting well to Sunfire's nuclear fire, was enveloped by an extremely low temperature caused by storm, and crumbled, too. But, after the battle, one of the destroyed armors produced an hologram: Moses Magnum promised to sink the Japanese island unless he was proclaimed unique ruler of Japan. (Uncanny X-Men I#120 (fb)) - Vindicator studied a record of the battle among the X-Men and the Mandroids. (Uncanny X-Men I#119) - Moses Magnum's base on the Kurili Islands was attacked by the X-Men, but, this time, the criminal had two Mandroids Mark II ready for them. The situation seemed hopeless for Cyclops, but Colossus' rage multiplied his strength, the Mandroid managed to fire only one blast, and were soon defeated by the Russian mutant. Moses Magnum was believed dead in the explosion of the Island. (X-Men II#110 (fb)/Uncanny X-Men I#129-131(fb) ) - The X-Men fought against men in red armors, which weapons had been adapted and created for specifically counteracting and cancelling the X-Men's powers. The armored men were Hellfire Club lackeys. Years later, Kitty Pryde recalled that encounter, referring to them as "Mandroids". (Incredible Hulk II#245/246) - The SHIELD built a Super-Mandroid model of suit, the U.S. Army requisitioned the Super-armor and sent it to Gamma Base. There, Glenn Talbot used the suit to fight the Incredible Hulk. The Super-Mandroid armor was destroyed by the powerful behemot. (Spider Woman I#34) - Moses Magnum, through the Deterrence Research Corporation, a company dealing in munitions and researching in weapons, bought and improved some units of the Mandroid armor and employed them as private soldiers, shock troops and assassins. The improved models Mark II had different colors among them, Orange, Purple, Light Green and Blue; they didn't have fingers but kept the projectors; the boots were slightly different, their weapons and armors seemed the same. The DRC Mandroids went in action when Spider Woman (Jessica Drew) tried to free Mrs. Sheridan from one of the East Coast DCR Research facilities. Against two of them, Spider Woman was in real trouble, but the purple Mandroid turned out to be driven by Mrs. Sheridan, who blasted and knocked out the orange Mandroid. Another team of four Mandroid, pursued the two women on the highways and tried to kill them shooting their lethal blasts. Spider Woman, transporting Mrs. Sheridan, soared toward the wall of flames of a huge brushfire. The Mandroids tried to follow them as best they can. The air was too hot and filthy for their sophisticated armors and they gave up, but the two women succeded in surviving. (Incredible Hulk II#275) - In the abandoned Gamma Base, in the most protected part of it, the Gamma Ray Research Lab, a Mandroid suit was stored, beside other powerful weapons like Megalith. (Spider Woman I#46) - Months later, a team of Mandroids was sent by DRC to murder Wilson Fisk and General Nguyen Ngoc Coy. They were stopped again by Spider-Woman, who had been informed about the meeting by a head of a Yakuza clan, Imura. The first Mandroid easily fell under a full-force venomous blast; the second one was buried under a roof tumbled down; the other two succumbed to the Spider-Woman's superior agility and strength. The men in the Mandroids were arrested by the San Francisco police and Sabrina Morrel. 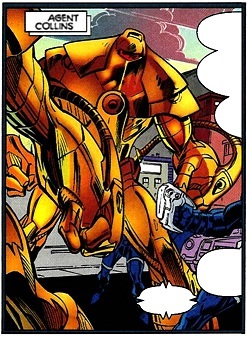 (Defenders I#127) - Some Mek-Men, robotic lifeforms whose shapes were very similar to the Mandroids' exo-skeleton Mark I, built by the Secret Empire and under Professor Power's orders, captured Cloud after defeating the Defenders. (Uncanny X-Men I#193) - The Militar Command of the U.S. Air Force in Mount Cheyenne added to its defensive force a numerous contingent of Secbots, battle armors with men inside, which were a less-powerful version of the Mandroid armor. 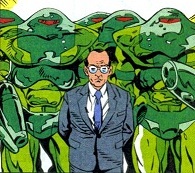 (Marvel Graphic Novel#18: The Sensational She-Hulk) - The Deltite hidden council of the SHIELD planned the operation: Green Genes to capture She-Hulk. Three Mandroids Mark II were teleported to the New York East Village to arrest her. They hadn't a warrant, so She-Hulk resisted. Mandroid L3 grabbed her wirst only to betossed away, while the Jade Giantess slapped Mandroid L7. Mandroid L5 blasted the ground under She-Hulk's feet, but the people around started protesting for the Nazi methods used by the agents. Understanding that the physical force wasn't the right tactic, the Mandroid's leader ordered to use the Neuro-stunners, which, infact had effect on She-Hulk. Despite the weakness and the vertigoes, She-Hulk smashed a car on L5's chest and also spinned around L3 and L7 until she smashed them together. The Mandroid unit 5, understanding that they couldn't handle the situation asked for the emergency procedure so, after few seconds, the Mandroids, She-Hulk and the civilians near them were teletransported on the SHIELD helicarrier. Eventually, She-Hulk surrendered, but intelligent cockroaches took control of the Helicarrier destroying it and probably all the Mandroid suits inside. (Comet Man#3) - A Mandroid unit Mark I intervened because of Hulk wandering near Cape Canaveral. Comet Man had almost succeded in having Hulk trasformed in Banner when the Mandroid arrived and discharged 50,000 volts through the still-green Banner. The trasformation was reversed, Hulk beated the Mandroid and jumped away. (Best of Marvel Comics#1/8) - Japanese tycoon Sabuko's fortress was guarded by agents wearing Mandroid armors. Wolverine defeated them and saved Mariko, who had been abducted by Sabuko. 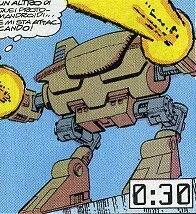 (Spectacular Spider-Man II#118) - The SHIELD sent a team of three Mandroids Mark II driven by the agents Simons, Davis and Griepp, to capture a kid with explosive powers. The Mandroids failed in capturing the kid, who was helped by Spider-Man, but the mission succeeded because the kid was killed and the menace eliminated. 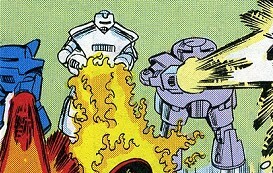 (Iron Man I#227) - The SHIELD had five Mandroids at disposal, all Mark II, and sent them all in mission to Upstate New Yotk to capture Iron Man. Unfortunately for them, it was a trap schemed by Tony Stark to destroy all the circuitries contained in the armors which were also related to the Iron Man armor secrets. Taken by surprise by Iron Man, some Mandroids hold their ground for a while, but eventually the were all deactivated by Iron Man's Negator Packs, neutralizer which fused all the circuitries. Tony Stark had reached his goal to erase his technology from the armors. (CaptainAmerica I#351) - Weeks after the SHIELD had been dismantled, Nick Fury, Gabe Jones and Dum-Dum Dugan, went to the abandoned heaquarters in Manhattan to erase the data from the computers. Captain America helped them in cleaning up using one of the Mandroids prototypes. But, suddenly, the computer and the proto-Mandroids in the arsenal rebelled, remotely driven by Machinesmith and tried to kill them all. When Nick Fury destroyed Simon, the computer, the menace ceased. 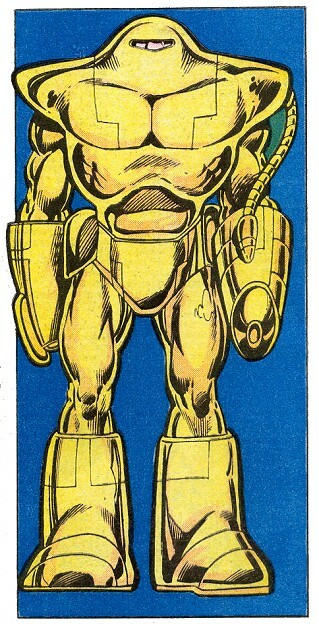 (New Warriors I#5) - Stane International built some Mandroids to use them as private guards and mercenaries. They used two different models of Mandroids. Some suits were very similar to the SHIELD's Mark II, the main part of these units had only blasters on the wrists, but some units had a claw on the left arm. The second model was bigger and some units had hands instead of blasters, they probably were based on the Mandroid's Mark IV exoskeleton. A contingent of Mandroids was dispatched to the Babyun Islands in the Philippines, where the Stane Int. had to launch a rocket ship. Star Thief tried to destroy the rocket but the New Warriors stopped him. When the New Warriors entered in the missilistic base, Robert Hanklin ordered to the Mandroids to kill the intruders. The first team of Mandroids was defeated by the New Warriors, the second team was flung away by the rocket's ejection. (New Warriors I#6) - After the launch, the Mandroids ceased the hostilities and accepted the New Warriors's help against the fire caused by the rocket. The Mandroids converted their right forearms in flame-retardant foam launchers and worked at the flank of Nova (Rich Rider) , Night Trasher (Dwayne Taylor) and Speedball, saving lifes and putting out the fire. 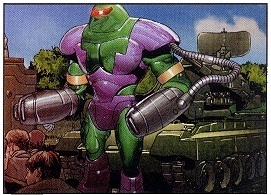 (Incredible Hulk II#390 (fb) - BTS) - The SHIELD projected a new, modified exoskeleton Mark V for the Mandroid armor and created several units. The CIA, agreed to lend some Mandroids units Mark V to Farnoq Dahn, religious and politic leader of Trans-Sabal, in exchange of its energetic services for the needs of the USA. Some groups of Mandroids armor were sent in Trans-Sabal, with the SHIELD personnel to instruct the Trans-Sabalian pilots. (Incredible Hulk II#390) - The Mandroids were employeed by Farnoq to destroy the resistance opposing to the tyrannical government. The Mandroids had to confront high-technology enemies, helped by the Pantheon's leaders, soldiers and equipment. (Incredible Hulk II#390/New Warriors I#29 (fb)) - The Mandroids teams led by units M1 and M4 were winning the battle against the rebels' regular troops, but when Hulk reached his Pantheon's allies, neither the deadly firepower nor the brand, stronger new armors of the Mandroids could avoid the defeat; the units from M1 to M9 were smashed, crashed, destroyed, shot, cut and one of the pilots was killed. (X-Factor I#76) - Other Mandroids were present at the battle near the Sendara Pass in Trans-Sabal, two of them were defeated by Hector of the Pantheon, they were not destroyed thanls to the intervention of X-Factor. (Incredible Hulk II#392 - BTS) - Rick Jones stole the armor M17 and managed to enter in the tyrant's palace. (Incredible Hulk II#392) - Jones faked to be one of the Mandroids helding Havok captive, arriving in time to see Farnoq Dahn coldbloodedly killing his ally, the CIA agent Galvin. (Incredible Hulk II#392/New Warriors I#29 (fb)) - Later, although the Pantheon had won the batlle to liberate the Capital of Trans-Sabal, Rick Jones saw the people kneeling before Farnoq, hopelessly worshipping him as a God. Still in the Mandroid armor, Jones shot Farnoq Dahn to death. (New Warriors I#29 (fb) - BTS) - The CIA didn't retire the Mandroids from Trans-Sabal, instead it continued and send other armors there, supporting the new monarch, Jalfaha. (Deathlok II#12) - SHIELD Agent Earl Angstrom sent a group of Mandroids to capture Deathlok as he was speaking with Nick Fury, hoping to kill Deathlok as revenge for his deceased son, whom he thought Deathlok had killed. Unfortunately for them, Deathlok managed to defeat them. 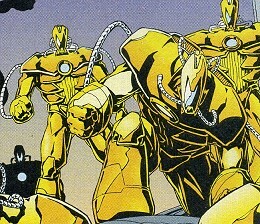 (Iron Man I#283) - Justin Hammer developed some Mandroid suits and used them as guards on his sea-floating base. The suits, similar to those used by the Stane International, derived from the Mark IV Exo-Skeleton. Three Mandroids were activated when War Machine assaulted Hammer's floating base. Only one of them managed to hit War Machine using its machine-gun, before being all crushed in few seconds. (Deathlok II#15) - During a battle between Deathlok and the monster Biohazard, a Mandroid entered the fray and helped Deathlok rescue his wife Tracy. 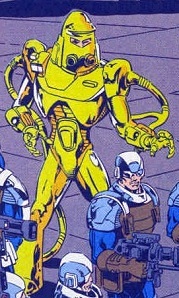 Shortly after Biohazard's defeat, the Mandroid revealed himself as SHIELD Agent Earl Angstrom, who then apologized for mistaking Deathlok for his son's killer earlier, realizing that the true killer had been Biohazard. Upon discovering that Biohazard had been reproducing instead of shedding, Earl convinced Deathlok to accompany him on a mission to find Biohazard's offspring. The two soon found one of them attacking family members of John Kelly and they quickly destroyed it by destroying its brain. (Uncanny X-Men Annual I#16/2) - Three terrorists led by a mutant stole four Mandroid armors and, wearing them, assaulted a nuclear plant with the purpose to steal the uranium stored there. Archangel intervened to stop them. 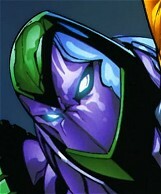 The Mandroids lost time trying hitting him while one of them was deactivated by Archangel's feathers. The leader of the terrorist managed to hit Warren at close distance, wounding him seriously. However, when they went out the nuclear plant they found the Police which arrested them all with the exception of the leader, who died fighting. (New Warriors I#29 (fb)) - A Trans-Sabalian army's squad of Mandroids was battling the Jalfaha's monarchist soldiers and the rebels of the People's Armed Forces Front. The New Warriors arrived on the battlefield and in few minutes crashed and melted the Mandroids, driving the battle in favor of the P.A.F.F. Hours later, the marching Trans-Sabalian army, including other Mandroids was intercepted by the Force of Nature and another battle started. The New Warriors arrived and tried to stop the two groups. The Lead Mandroid was driven by General Halladah, self-proclaimed general of the Army. Aqueduct, controlling the cooling liquid coursing into the walking tank, short-circuited the entire armor. The battle ended with the death of Halladah at the hands of Namorita. (Black Axe#2) - The Hand revived the superhuman ninja known as Kage, and provided some of their warriors with Mandroids armor. Black Axe helped oppose the Hand, and their battle attracted the attention of the National Defense Force. The Japanese Prime Minister authorized the use of a team of operatives wearing high-tech battle armor, called Counterforce, to investigate. They were accompanied by Sunfire, who initially assumed Black Axe to be an enemy, but Kaori convinced him otherwise. Together they put a stop to the Hands plans to steal the Great Sword, a supposedly perfect sword of mythical status, from Kaori Tamayoshi. (New Warriors I#36) - A squad of green Mandroids Mark II was dispatched to the Vault. When a revolt led by the Wizard arose, despite the efforts of the Guardsmen, Warden Jzemlico took the Mandroids to the fight only to discover that things had been just worked out by Vance Astrovik and Guardsman #6. (Avengers I#368) - In a preventive action against the Avengers, Nick Fury surrounded the Avengers' Mansion with a SHIELD force composed by field agents, Mandroids Mark II, militar jets, and other special weapons. Crystal learnt that Luna had been kidnapped, so, the Avengers tried to leave for Genosha and discovered that the U.N.O. had ordered the SHIELD forces to keep them from interferring with the Genoshan civil war. (X-Men II#26 - BTS) - SHIELD forces and the Mandroids battled the heroes but some Avengers succeeded in taking off with a Quinjet. (Avengers West Coast#101 / Uncanny X-Men I#307 - BTS) - Some modified Mandroids Mark VI were employed by SHIELD as watchdogs for the Avengers who went to the U.N. building to protest against the negated permission to go to Genosha. (Thunderstrike#5) - Spider-Man, Thunderstrike, and agent Andrew Jackson landed on the SHIELD Helicarrier and Thunderstrike caused a thunder which tilted up the base electronic systems. Five Mandroids Mark I went out on the deck, led by the special Agent DePaul piloting a Super-Mandroid armor to capture the intruders. (Thunderstrike#6) - The three intruders claimed the surrender but the unexpected Stellaris' attack drove DePaul to use hard manners. The Mandroids started to shooting to everybody. A couple of Mandroids were soon felled by Stellaris' energy blasts; she also crashed a Mandroid's hand-grip, simply expanding her armor. Spider-Man broke the power cable of another Mandroid, shutting it down, and finally, Stellaris ripped open DePaul's armor, but, before he could be harmed, Nick Fury arrived just in time to calm down the things. Despite the huge cost in damages for the contributors, the intruders were let free. (Incredible Hulk Annual I#20/3) - Some Mandroids were still in Trans-Sabal to help the local governement. When Achilles and Ajax invaded the Trans-Sabal air space and badly landed in the desert, a team of steel-colored Mandroid Mark I attacked them. Their weapons didn't hurt Achilles nor they had the time to hit Ajax, a sudden attack fom behind felled all the Mandroids: the Arabian Knight had easily beaten them. 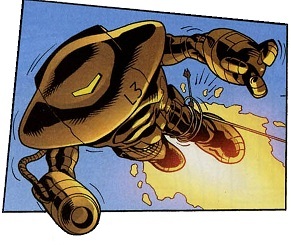 (Thunderstrike#13) - Among the various high-technolgy devices and weapons assigned to the Project: Sinkhole there was also a Mandroid armor Mark I. When some intruders were detected in the sub-basements in the abandoned SHIELD old headquarters under Manhattan, the leader of the project, SHIELD Agent DePaul, wore the suit to handle the visitors and to prevent any enemy to come in contact with the inferno 43 element. He found Thunderstrike and Luke Cage but all they were surprised by the real threat: Mongoose, Quicksand and Bison. A sand barrage blinded the heroes! (Thunderstrike#14) - DePaul attacked Bison and managed to knock him down but when Bison's rage mounted on, the armor couldn't resist to Bison's blows. With the armor ruptured and more than half of the weapons systems off-line, the suit was still mobile. Unfortunately, the flooding of the base reached DePaul and the water touched the broken armor and shocked the agent down. Bison freed the agent from the suit and let the armor in the dephts of the base. (Uncanny X-Men I#387 (fb) - BTS) - The first model of Mandroid suit was officially dismissed by SHIELD. (Avengers I#389 (fb) - BTS) - A new model of Mandroid was produced, under the pressure of a special commission of the Congress. The external design of the armor and the helmet underwent a noticeable change. Three new, blue Mandroids were sent in mission to retrieve a cylinder come from the Shi'ar interstellar portal in the Solar system. Other three times the portal had been used in few months, and this could produce a Sun instability, so Gyrich employeed the Mandroids to investigate. The Mandroids tracked the alien cylinder down to New York City and discovered that an alien waited for picking it up: Deathcry. (Avengers I#389) - Deathcry refused to give the box to the agents, they pursued her trying to capture and also to kill her. Deathcry slashed an armor with her claws, then Hercules, Quicksilver and Crystal arrived to help the girl. The two remaining Mandroids had no chance against them and were easily taken out of game. Gyrich admitted that the Mandroids project had to be revised. (Iron Man I#325 - BTS) - The Mandroid armor was upgraded, the shape slightly changed and the offensive device on the rigth arm went away for a four-fingered hand. (Iron Man I#325) - After the battle between Avengers and Anachronauts just before the Avengers Mansion, the State Departement ordered to the Avengers to remain in the Mansion until they would clear the causes of the battle. Gyrich went to the Mansion with a platoon of Mandroids Mark VII to hold there the Avengers. They found the Avengers leaving the base, Gyrich tried to stop them and a fight started. (Iron Man I#325 - BTS) - Although they were about 20 units, the Mandroids could only slow the Avengers down, in the end they were defeated by the heroes who didn't arrive in time in the Artic to protect the young Tony Stark. (War Machine I#25) - Some Mandroids Mark VII were used by the SHIELD Agent Groom, when he wanted to capture Rhodes and contain the alien entity inside him. One of the Mandroids carried a portable energy cannon, never seen before as equipment in other Mandroid suits. Groom wore a Mandroid exo-suit, and with other two Mandroids went to the SHIELD infirmary of Bakersfield. Rhodes let the Eidolon Warwear come out and in few seconds smashed and knocked down the Mandroids. Groom's helmet was slashed with a single swing; he was left unscathed but the battle was over. The day after, Groom deployed a whole contingent of Mandroids to apprehend Rhodes. The sheer numbers didn't help the SHIELD agents; the Eidolon War-Form's remotes, blades and energy blasts overpowered them, none of them managed to hit or touch their target. Everybody fell in few minutes and Groom, too, was knocked out. (Punisher III#7) - A team of Mandroids Mark II was included in the numerous forces gathered by Mikel Fury to capture Frank Castle. The Mandroids helped the ground squad who had to surround Geraci's house, giving air cover to the troop. Frank Castle was captured. 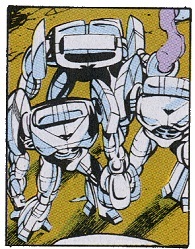 (Domino I#1) - Some Mandroid units Mark II were sent to an undergroud prison in the desert as part of the surveillance personnel for Milo Thurman. These suits were equipped with an advanced mechanism of identity check. They were able to do a genetic examination, scanning a part of the body of a subject with a light-red ray of light and checking if the DNA nucleotide sequence matched in their database. 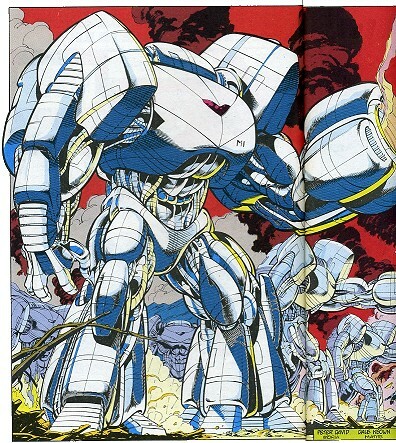 Their armor was still of titanium, its design didn't include hands, had only one tube on the right arm and had circular hip-pods. (Domino I#1 - BTS) - Lady Deathstrike entered in the secret installation and took Thurman with her. Gyrich discovered the intrusion and the entire installation was alerted. The Mandroids at guard of the cells tried to stop Lady Deathstrike but were slashed and slain by her claws as many other unprotected agents. (Domino I#1) - Later, two Mandroids also found Domino in the installation. They weren't even scratched by Domino's phasers but Domino's luck had the two armored agents shoot each other with their respective lasers. Shortly after, a bomb activated by Domino destroyed the entire installation. (Hercules: Heart of Chaos#1 (fb) - BTS) - The SHIELD renewed the Mandroid design starting from the Mark I exo-skeleton. Colored in black, their new plasma cannons from the fingers could reduce an armored bunker in molten shards. (Hercules: Heart of Chaos#3 (fb) - BTS) - Ares involved the special agent DePaul in his plans of terrorism and war, thanks to DePaul, Ares could access to some units of Mandroids to be driven by his Warhawks. (Hercules: Heart of Chaos#1) - Calling his Mandroids "Dogs of War", Ares sent them to attack Hercules but the mighty of the Prince of Power proven to be too much even for the armored warriors. (Hercules: Heart of Chaos#3) - On the SHIELD Helicarrier, one of the Ares' Mandroids and other Warhawks confronted Hercules. The armored behemot caused serious troubles to Hercules but eventually succumbed to a huge electrocution. (Captain America III#20) - During a routine test in the SHIELD base of Manhattan, the Mandroid armors started to exploding and breaking apart. The "vibranium cancer" caused by Captain America's shield destruction had involved the armors, too. All the armors in the base were destroyed, some of them causing severe wounds to the men inside. All the models seemed to be Mark II. (Conspiracy#2) - After retired General Edward Harrison led reporter Mark Ewing to his Sanctuary base and explained to him the theories about a government agency called Control that manipulated the rise in the superhuman population, SHIELD tracked Ewing to the base and surrounded it. A team of Mandorids Mark II scouted the area, and shortly later one of them found Ewing who had escaped into the woods. Under Dum Dum Dugan's orders, the Mandroids continued to search for Harrison, but his fate remains unrevealed. (Thunderbolts I#15) - General Bridge led a SHIELD retrieval squad to capture the Thunderbolts. In the team there were at least three Mandroids. Despite the high number of soldiers and super-humans, the Mandroids only battled Moonstone. 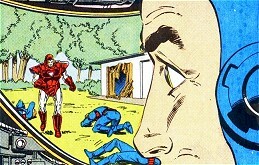 Earl Collins' armor was ripped out without effort by Moonstone and was hurled and smashed against the other Mandroid, putting both out of game. (Thunderbolts I#16) - While the Thunderbolts defeated the Great Lakes Avengers, the Mandroids and the rest of SHIELD squad waited for the GLAs. The Thunderbolts, disguised as the Great Lakes Avengers, deceived Bridge and escaped. (X-Factor I#148) - A team of five SHIELD Mandroids were included in the forces gathered by Henry Gyrich to capture Havok. The Mandroids were specially designed. Their shape was different from the previous models, and had two torchlights on shoulders. The Mandroids surrounded the hut where Havok was, but Polaris helped Havok to escape in the underground mines. 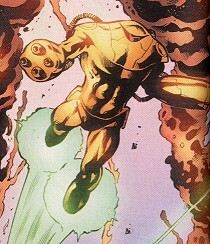 A Mandroid reached them but he was prepared to neutralize Havok, so was taken by surprise by Polaris' powers. An EM pulse shorted out his armor. The other units flew outside the mines and reached the fugitives. 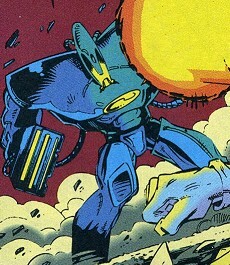 A shot from an unit almost hit Havok, then Polaris emitted an enormous EM pulse which disrupted all the electronic equipment in a radius of 12 meters, including the Mandroids. One armor's computer ceased to accept manual commands, the pilot wasn't able to do the emergency override, so the armor went crazy, shooting randomly. It grabbed Gyrich and started crushing him. With his plasma burst, Havok cut the suit in pieces, freed the pilot and Gyrich just in time, the armor exploded. (Generation X: Crossroads: Chapter One) - Generation X stopped a group of the World Federalists from an assault on an airport in Seattle. Ivan reported their defeat, but also shared the fact that the diversion had successfully allowed "the package" (a set of partially assembled Mandroid armors) to make it on a truck bound for the transfer point. Ivan also revealed the involvement of the mutants, and the Expatriate instructed Ivan to send pictures so they could analyze the threat. (Generation X: Crossroads: Chapter Six) - Ivan met with Dr. Frances Bervin, inspecting the Mandroids she was assembling, testing her Electromagnetic Constrictor device , and making it clear the penalties she would face if she did not meet the Expatriate's time table. (Generation X: Crossroads: Chapter Eight (fb) - BTS) - Ivan followed the Expatriate's instructions, and Hollywood special effects expert Jimmy Scofield was hired to make one of the Mandroids look like a primitive human girl. This girl was intended to pose as "Peg," to be used to heighten anti-mutant tensions. (Generation X: Crossroads: Chapter Ten) - Ivan met with Scofield and Bervin, examining the progress on the Mandroid units and Peg in particular, making certain that both workers knew the penalty for failing to satisfy the Expatriate. Meanwhile, the Expatriate agreed to sell weapons to the World Federalists if they agreed to change their attack site from the Washington Monument to Mount Rushmore. This would cause the mutants traveling to Chicago to meet with a delay to better allow the Mandroids to be completed. (Generation X: Crossroads: Chapter Twelve) - Ivan reported the World Federalist's defeat and confirmed that the Expatriate had received the manual for operation of the Mandroid units. (Generation X: Crossroads: Chapter Fourteen) - The Expatriate and Ivan met, inspecting the Peg and other Mandroid units. The Expatriate revealed his plans to use the Peg unit to murder Walt Norman. (Generation X: Crossroads: Chapter Fifteen) - The Expatriate unwittingly left a message from the World Federalists up on his computer screen, leaving his office after receiving a report from Ivan and his assembled agents--Gonazalez, Petra, Sledge, Vogle--who would operate the remaining five Mandroid units. Later, when Walt Norman attempted to make a surprise confrontation with McComb from McComb's office, he discovered the message on the screen. Correctly surmising that "McComb" was working with terrorists, Walt fired him. Not wanting to risk alerting the entire building by trying to kill Norman--who had found the Expatriate's gun with McComb's desk--then and there, the Expatriate left, then contacted Ivan telling him that he would personally operate the Peg unit to gain vengeance on Walt Norman. (Generation X: Crossroads: Chapter Sixteen) - Ivan, Gonazalez, Petra, Sledge, and Vogle operated the five standard Mandroid units, ambushing Generation X, but ultimately meeting defeat. The Expatriate, operating the "Peg" unit, was dropped off by a van outside of the Walt Norman Show building. Making certain to be seen by bystanders, doormen, etc., "Peg" headed up to the Show's set on the 6th floor. Working together, Generation X took down their Mandroid-wearing attackers. Figuring it was too late to stop him, Ivan revealed the Expatriate's plan to kill Walt Norman and frame "Peg." (Generation X: Crossroads: Chapter Seventeen) - "Peg" arrived at the set, confronting Walt and preparing to kill him. Mrs. Dale stepped long enough to delay the Expatriate until Husk and Chamber could arrive. Introducing herself as the real "Peg," Husk--in stone form--punched him; undamaged but shaken, the Expatriate fought back. 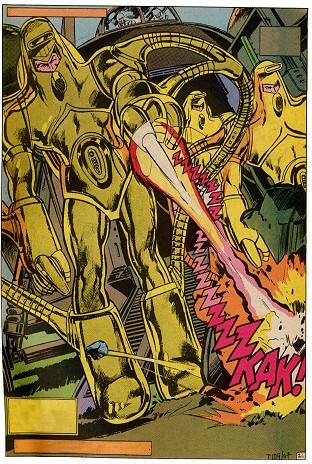 "Peg" blasted Husk away, but Chamber's next strike destroyed the "Peg" facade over the Mandroid unit, exposing his farce. Determined to win, the Expatriate used the Electromagnetic Constrictor device against Chamber; but Chamber used his full power in fighting off the assault, causing a backlash that crushed the Mandroid Unit, and the Expatriate in it. Unmasked, Trent survived only long enough to tell Walt how much Walt was worth to him dead. (Avengers Forever#1) - Some Mandroids were detached in the Blue Area on the Moon, as part of the surveillance personnel for the Kree Supreme Intelligence. They checked the Avengers identities and let interrogate the Supreme Intelligence. Later, Immortus stopped the time in the Blue Area and the Mandroids were "frozen", too. (FantasticFour III#13) - The SHIELD employeed 6 purple Mandroids Mark II as "heavyweights" in a Federal operation on the top of the Baxter Building. The mission consisted in convoying three Kree prisoners to a Kree representant. Instead, Ronan the Accuser showed on to free the Krees. The Fantastic Four intervened, the Mandroids were easily deactivated by an EM impulse from Ronan, who defeated the Fantastic Four and tele-transported the heroes on the Moon. (Spider-Woman III#15) - Three criminals in Mandroid suits were stopped by Captain America. The men in the Mandroids were too self-confident, Captain America was easily dealing with them and the arrival of Spider-Woman (Mattie Franklin) almost complicated the fight. The heroes defeated the Mandroids in few minutes, opening a couple of them like tin boxes. (Uncanny X-Men I#387) - Starhammer, a D'Bari in search for vengeance against the Phoenix, joined forces with some Shi'ar and humans. He supplied the humans with some old Mandroid suits, armors Mark I retired from service years before. The Mandroids' strike squad had the task to distract the X-Men, so that Starhammer could meet and kill the Phoenix. Protected against telepathy thanks to Starhammer's armor, the Mandroids attacked the X-Men in a hospital were some of them were recovering. Although the Mandroids were defeated by Beast, Gambit and Rogue, their attack reached the goal, and Jean had to confront Starhammer alone. Nonetheless, she survived and stopped the alien. (Captain America III#39 (fb) - BTS) - Red Skull stole the plans of the Mandroid suit Mark I and sold them to A.I.M. A.I.M. built its own model of Mandroid, very similar to the original model. An innovation regarded the external layer, which could conduit the energy of the blasters creating an electrocuting field for everybody who touched the armor. (Captain America III#39) - Chet Manning, the director of A.I.M., wore an A.I.M. 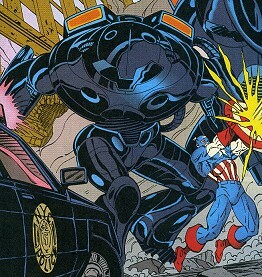 Mandroid armor to escape from its base in Iowa, after the attack of SHIELD and Captain America. Captain America managed to grab him while flying and smashed the primary battery. The Mandroid fell to the ground, defeated. (Incredible Hulk Annual 2001) - A team of 8 or more Mandroids Mark II and the U.S. Army were sent in Midtown Manhattan to stop the Hulk. The Mandroids distracted the behemot for some moments but the Hulk caused a huge shockwave which caused destruction for miles and had a building collapse above the Mandroids. (X-Treme X-Men I#26 (fb) - BTS) - The Oyama Corporation built a new type of Mandroid armor. (X-Treme X-Men I#26-30) - Lady Deathstrike gave two of her Mandroid armors to Reverend Stryker and Kitty Pryde. Stryker used his suit to control the Pryde's one and let her precede him to Mount Haven. There they discovered that a cybernetic intelligence was controlling all the mutants of the town. Eventually Stryker merged with the cyber-intelligence and Mount Haven was forgotten. (Secret War: From the Files of Nick Fury (fb) - BTS) - SHIELD armor's engineers projected a new Mandroid armor Mark X and build prototypes 1 and 2. Because of critical malfunctions and missteps, the first two prototypes were destroyed. The newest design used a totally different technology than Stark's and gave birth to a third prototype, stable. The armor Mark X was kept secret from all of SHIELD. Fury planned to equip James Rhodes with the new armor and he would send him into Latveria for the Secret War (along with a few other superheroes) if the initial team he sent in failed. (Secret War#4) - Two agents were equipped from Lucia von Bardas with Mandroid armors Mark X. As revenge for the preemptive attack of the Secret War set up by Fury. One night, they attacked Wolverine at Westchester, trying to burn him to ashes. (Secret War#5 (fb) - BTS) - Wolverine, alone, defeated the Mandroids. (Wolverine II#46/47) - Damage Control's CEO, Walter Declun, set up a trap for Wolverine, using the company "Mandroids" to kill him. (Marvel Comics Presents II#5/2) - Roxxon Corporation set up an operation for stealing vibranium from the Savage Land, and sent some Mandroids and mercenaries, alongside Manticore and Saboteur, led by Killer Shrike, to dispose of Ka-Zar, who had spoiled their operation before. The mercenaries underestimated Ka-Zar, who surprised them attacking with the help of Devil Dinosaur, who ate a Mandroid. Moon Boy, Shanna and many other warriors attacked armed with Vibranium tipped arrows. The vibranium arrows dissolved the Mandroids' shells, Manticore and Saboteur's cyborg implants, defeating Roxxon forces. Mr. Kaminski, director of the operations of invasion, hired an expert of the Savage Land: Edgar Parnival Plunder. (Marvel Comics Presents II#6/2) - Plunder had made a device which counteracted the melting ability of vibranium. Kaminski and he led another attack to the Land driving a giant robot. Killer Shrike, Saboteur, Mandroids and mercenaries invaded the Land held back by Ka-Zar, helped by Mutates and Stegron. The Mandroids slaughtered a lot of the dinosaurs led by Stegron and the defenders run for the jungle. Killer Shrike knocked down Ka-Zar, then unleashed the Mandroids to chase the fugitives, holding a couple of them to guard the prisoners. (Marvel Comics Presents II#7/2) - Stegron revived the dead dinosaurs taking Killer Shrike and the Roxxon forces by surprise. The Mutates, Ka-Zar, Devil Dinosaur and Moon-Boy attacked back as planned, overwhelming the mercenaries. Barbarus torn apiece a whole arm of a Mandroid. Ka-Zar captured Parnival Plunder and Devil Dinosaur ate Kaminski, the battle was lost for Roxxon. (Black Panther V#11) - Declun, under Doctor Doom's orders, gathered several superhumans on an island in the Pacific. Among his troops, there were some Mandroids. (Black Panther V#12) - Defending their base, the Mandroids attacked the Black Panther (Shuri) and her allies, the Fantastic Four and Namor the Sub-Mariner. One of the Mandroids was deceived by the Black Panther's olograms and heat generators, and was easily sabotaged. Two other Mandroids were seriously damaged by Namor. (Invincible Iron Man II#25) - After the Siege of Asgard, H.A.M.M.E.R. was dismantled and among the weapons and the material put on auction there were some green-purple Mandroid Armors Mark II. They were bought by Justine Hammer. (Captain America I#610) - After a battle between "Iron Hand" Hauptmann and Steve Rogers, Falcon and the Black Widow, SHIELD forces examined James Barnes' house and the neighborhoods. Among them, there was a Mandroid Mark II team. (Wolverine V#3) - A team of at least 6 Mandroids (apparently Mark I) was dispatched at the Blenkin Farmaceutics complex in of New York, for an emergency by night. They knew that a robbery was in act but they weren't able to find the responsible. So, when they met an intruder they immediately attacked him. They didn't recognize the costumed hero, nor gave him the time to speak. This was a big mistake, because in the resulting fight two exoskeletons were destroyed; the first, driven by Karl, hit by the energy blasts of his colleagues, the second cut to pieces by Wolverine's adamantium claws. The third accepted Wolverine's help and they soon found the burglars, that were helped by a sensory interference plan. Actually the personnel of the company and some policemen were mind-controlled by an alien virus and they attacked both the Avenger and the armored agent. The SHIELD agent called for help, and three other Mandroids arrived in the hangar; they were more than equipped to deal with ordinary people but didn't arrive in time to block the theft of the container. (Venom II#16) - Richard Deacon, a dangerous criminal and a metahuman known as the Human Fly had been captured and was being transferred to the Raft. The responsible for his transfer was agent Venom (Flash Thompson). On the train used for the transport, many other guards were present, and among them there was Agent Darlymple and a couple of Mandroids Mark II. Darlymple was actually Hobgoblin (Phil Urich) in disguise, hired by Kingpin to kill Deacon. 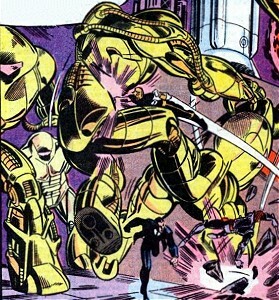 During the mission Darlymple convinced Venom that one of the the two Mandroids was the actual killer, so when Venom brought Deacon into another cell, Hobgoblin had the opportunity to assault the Mandroids alone. Taken by surprise, the first Mandroid fell, with the helm torn in two by a slash of Hobgoblin's flaming sword. One instant later, the second Mandroid was stabbed in the back. The fight escalated, with Hobgoblin killing other agents, and fighting Venom and the Fly. In the end the killer was thrown off the train by Venom, but the hero had to let the Fly escape, in order to save another agent in peril. Comments: Created by Roy Thomas (writer), Neal Adams (pencils) and Tom Palmer (inks). In X-Men II#110, Kitty Pryde recalled her first meeting with the X-Men, during which they were attacked by some Hellfire's men in armors. She called the lackeys "Mandroids". The original story took place in Uncanny X-Men I#119. Looking at the model and shape of the armors, the only thing which the armors had in common with the Mandroids was the fact that their weapons had been adapted to contrast some specific super-powers. Neither size nor shape, nor ordinary and common weapons were similar to the Mandroid armors. This is why I suppose Kitty was wrong and why I didn't report here the history/characteristics of those armors. In X-Men Unlimited#28 (September, 2000) in Vozrozhdoniya, an island in the Aral sea, the X-Men were attacked by robots very similar to Mandroids, built by the USSR. In Web of Spider-Man I#4, years before Code: Blue, the NYPD tried to use a cybernetic armor rather similar to the Mandroids. It costed one million dollars and it was easily broken by Octopus' mechanical arms. The armors classification Mark Number is sure only for Mark I, II, III, IV and X. The rest are only logical assumptions. Even years after the creation ot the Mark I, which had two four-fingered prehensile hands, and after the creation of the Mark II, which did not have hands, there were Mandroids very similar to both types, with only one hand and a weapon at the end of the other arm. For short I referred to them as Mark II, unless there were strong evidences of the contrary. It is likely that some "intermediate" models, or prototypes were built before the Mark II, but were still employed after its introduction. 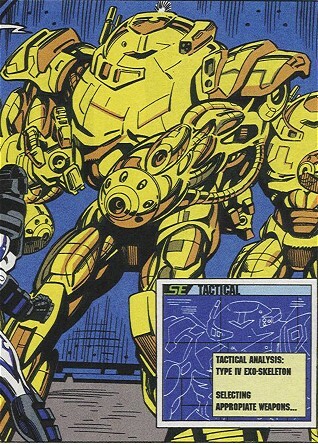 The technical specifications were taken from Marvel Handbooks or from the TSR "Weapons Locker" volume. They were detailed for Mark I and II, and a bit for Mark IV and X. The rest of the characteristics are only logical assumptions and inferences based on what is present in the stories. Even the dimensions can vary very much depending on the artist. Profile by Spidermay with the help of Proto-Man, Rob London and Snood. or any other character or item with a similar name. 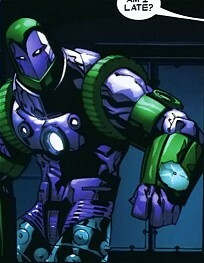 The Proto-Mandroids were prototypes of the Mandroid armor, made before the final project by Tony Stark. Some prototypes weren't even designed for attack purposes but just as cases of study about walking or increasing the physical strength. Other, instead, included weapons such as machine-guns, energy blasts and fire-throwing. (CaptainAmerica I#351) - The prototypes were stored in the SHIELD headquarters arsenal under Manhattan for years and were inactive and non-connected to the central computer system. Simon. After the SHIELD dismantling, Nick Fury, Gabe Jones and Dum-Dum Dugan, needed to erase the data from the computers. Just in that moment, Machinesmith was hacking the central computer. When the agents installed a virus in the mainframe to erase the data, Machinesmith activated the proto-Mandroids, the robots and the defense systems ordering them to kill all the agents. Captain America was attacked by some prototypes. He managed to avoid their blasts, fires and shots, till to making them explode with a grenade. When Nick Fury destroyed the computer the attack ceased. The most part of the prototypes was destroyed, the others were melted and recycled. Davis, Grieep and Simons were SHIELD agents trained for driving Mandroid armors. (Spectacular Spider-Man II#118) - The SHIELD was alerted about a dangerous kid with explosive powers walking in Manhattan, so, it sent a squad of agents and team of three Mandroids driven by Reggie Simons, Davis and Griepp, to capture the kid. The kid, Alexander Woolcot, was extremely scared by the apparition of what he believed "robots", and shot a frying powerful charge of energy on a Mandroid, burning the armor and the SHIELD agent Simons inside, almost killing him. Commander Helms ordered to Davis and Griepp to kill the kid. They tried, but Spider-Man saved him and with a trick managed to have the Mandroids shoot on each other. Their armors were damaged but the SHIELD agents inside were safe. Frank was a SHIELD agent, with the special training of a regular SHIELD agent plus the additional training for driving a Mandroid suit. (Iron Man I#227) - Frank and his four teammates went in mission to capture a rogue Iron Man, who Tony Stark had revealed to be Randall Pierce, whose hideout was in Upstate New York. The SHIELD forces surrounded Pierce's hideout, but actually, it was a trap schemed by Tony Stark to destroy all the circuitries in the armors that used the Iron Man secret technology. Frank drove the Mandroid Unit 3, approaching the hideout, the Mandroid units 2 and 5 crossed a mined camp and were immediately deactivated by some Negator Packs. Frank and others Mandorids activated their force fields and cleaned the ground using their Neuro-Cannons. Iron Man attacked their backs and with a double charge of his repulsor rays hurled Frank in the woods, but not harming him or its suit. The other Mandroids hold their ground for a while: a Mandroid, using the tractor beam, smashed a car above Iron Man. The lasers didn't caused so much trouble to Iron Man, who siphoned the energy from one Mandroid and placed a Negator on it. The force field at full force of the fourth Mandroid could not resist more than few seconds against Iron Man's punches, and another Negator Pack neutralized the Mandroid. Agent Frank was again on his legs, backed-up by other SHIELD agents, but Iron Man emitted a sonic signal. The signal scrambled the inner ear of the unprotected agents, leaving Frank alone against the Red-and-Silver Avengers. Having understood the superiority of the Iron-Man, Frank auto-ejected from the suit, and Iron Man deactivated it. Earl Collins was a SHIELD agent, with the special training of a regular SHIELD agent plus the additional training for driving a Mandroid suit. Its suit seemed a very upgraded version of Mark I-II. (Thunderbolts I#15) - Collins was part or a retrieval squad that had to capture the Thunderbolts in Colorado. In the team there were three Mandroids. Despite the high number of agents who surrounded the Thunderbolts, Collins was surprised a knocked down by Moonstone, who had popped up out of the ground. Earl, overconfident, managed to hit Moonstone, but only because she wanted it. She easily avoided his force blast which destroyed a car. After her well-put words had inflamed Jolt, she turned back to Collins and ripped apart his helmet. With a single swing she used Collins to hit the other mandroid and put both out of game. The Mandroids built by Damage Control were special suits of armors equipped with weapons and special offensive systems. The armors could give the wearer enhanced strength and protection, plus some unspecified offensive capabilities. The models equipped with whirling adamantium blades could virtually cut everything. (Wolverine II#46 (fb) - BTS) - For years, Damage Control picked up the pieces of several high-tech weapons and fixed and repaired it. Among these weapons, there were also Mandroid armors. Damage Control, then, built some armors mixing the technology they could use, creating their own type of Mandroid, adding SHIELD weaponry, Stark Industries Tech and other special weapons, such ase the whirling blades from Whirwind. (Wolverine II#46/47) - The DC's Mandroids were employeed against Wolverine, whose sabotaging acts were causing great damage to the company. (Wolverine II#47) - The guardsmen/Mandroids of Damage Control were cutting off Wolverine's head. Their armor gave out but Wolverine was pretty much down at that point. The two went over to their hurt friend, who warned them about the danger behind them. Two of Namor's Atlantean sleeper agents attacked them. The battlesuits built by Starktech endowed its wearer with enough firepower for stopping the Avengers, at least for few seconds. Impervious to taser blasts and even to atmospheric lightnings, the armors were so strong that they could rip a well tangled Spider-Man's web. They could fly thanks to boot thrusters but their pull was rather weak, because was barely sufficient to lift twice the weight of an armor. The armors could heat the outer layer to high temperature in order to hurt opponents, even the thick skin of Giant-Girl. Both arms were equipped with a concussive force cannon which could be reconfigured as a hand with three retractile fingers. Tony Stark built the exo-suits but he negated he gave them the codename "Mandroids". 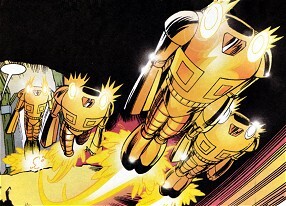 The batlesuits units L2 and L3 were stored in the Stark Tower and stolen by some of the the New Masters of Evil (Man-Bull, Melter, Whirlwind). The robbing was only a distraction in order to plant a transmitter in the Avengers' base, the deceit worked but Melter was captured. During Melter's transfer, the transport was assaulted by L2 and L3, hired by Elihas Starr. When the Avengers arrived, L3 claimed that they were "Mandroids", they hold the ground against Giant-Girl, Hawkey, Spider-Man and Wolverine for one minute before being defeated but they were expendable. Indeed Melter escaped and that was Starr's goal. One of the drivers was Karl, a henchman who will become Hate-Monger.